The MPulse interface adapts to any device—desktop computer, tablet, or mobile phone. Visualize maintenance schedules with custom calendar views, so your team can see what needs to happen when. Preventive maintenance (PM) is routine maintenance designed to prevent the need for more costly repairs. 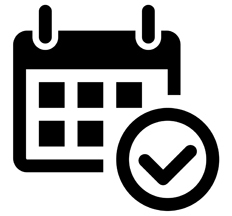 Our software for preventive maintenance scheduling and tracking makes this process a lot easier. Work Order Management is the heart of MPulse Software's CMMS solutions—helping you get the highest priority work done, while making sure lower priority work doesn’t slip through the cracks. You can easily receive work orders from an unlimited number of requesters, enter requests manually, and automate tasks via your preventive maintenance program. Basic Inventory system software provides simple records of inventory items and enables you to track and report on consumption of those items. The PartLink feature of this inventory software allows you to link items and their unit costs to work orders and assets. MPulse's easy-to-use maintenance reporting software features can help you quickly produce status reports and documents giving details or summaries of your team's maintenance work. Get easy access to the numbers you need to make important decisions. Maintenance customers can enter and initiate service requests and monitor the progress. Wish you had a quick and easy way of knowing when a critical piece of equipment needs repair? Want to know immediately when facilities require attention? When time is money, a picture can be worth more than a thousand words—or thousands of dollars. Take the complexity out of monitoring the health of your assets. MPulse asset production status boards will quickly show you the status of your entire asset inventory, on one screen. Save time and money by keeping your operations secure. Create a simple key management software system with MPulse Key and Lock Management. It’s easy to manage and track keys as well as authorized users, reducing the problem of lost or misplaced keys. MPulse Software's Advanced Inventory can help quickly identify what you need for which piece of equipment. Manage all your vendors in one place. See which vendors provide which services and who’s available. Track past performance. DataLink Integration Adapter connects MPulse with other critical applications. Easy interface allows you to easily integrate. MPulse condition-based maintenance software (CBM) is an add-on that keeps tabs on the actual state of your critical assets by recording the output of any meters and gauges on that asset. SAML SSO extends an organization’s internal directory to the MPulse cloud environment. Advanced search functionality takes you right where you need to go in a flash. Manage all facets of employee records: status, skill level, bill rate, contact info and more. Highly configurable “command center console” puts your most important data front and center.